The story of Fidel Antonio. 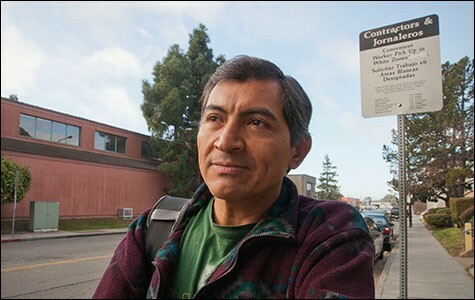 Antonio lives in Oakland but looks for work in Berkeley because he says the pay is better and the work is often easier. This photoessay was made possible with the help of the Alameda County Community Food Bank (ACCFB.org) and the Multicultural Institute (MIonline.org). The Food Bank will be releasing its study on hunger in Alameda County later this year. Day laborers are pretty much taken for granted, as they wave at cars passing the sidewalk where they look for work near Home Depot or the local lumberyard. 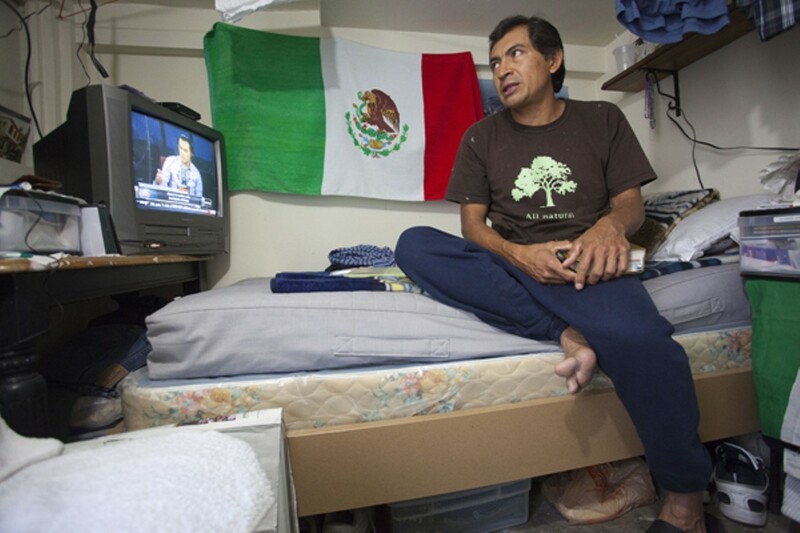 What road brought them to their street corners, far from their families in Mexico and Central America? What do they do if they don't get hired — where do they live and how do they eat? 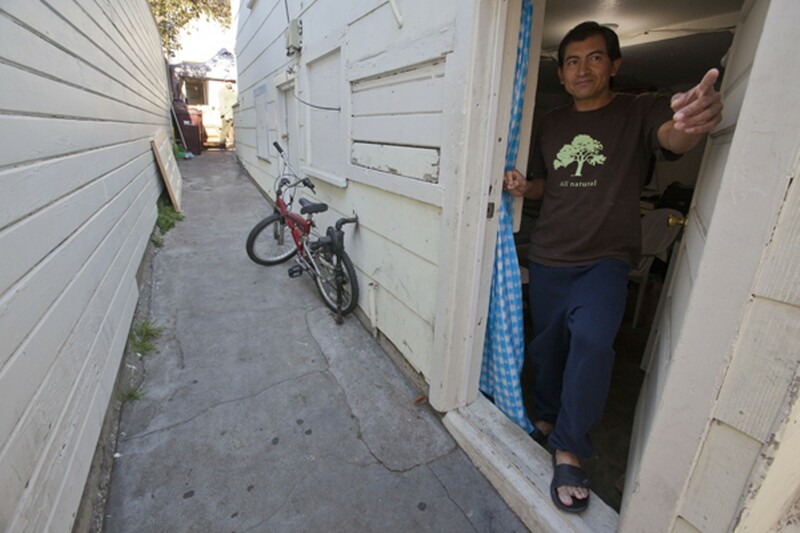 Fidel Antonio makes a living, barely, from jobs gained on the sidewalk near Truitt & White in Berkeley. 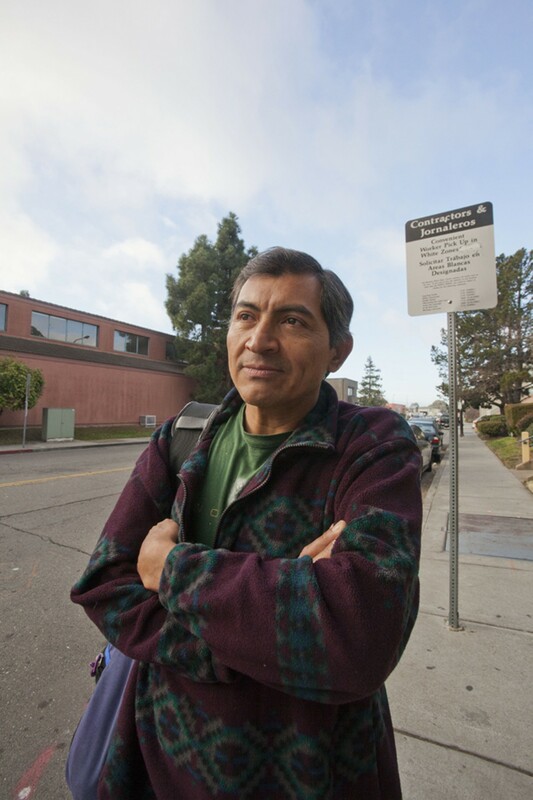 He lives in Oakland's Fruitvale, and every day takes a bus to this street corner hiring hall. He told his story to me in Spanish and the following is my translation of it. In the state of Morelos, my family was very poor, living just from one day to the next. My father had no land of his own, so landowners would rent him land. But he was a very hard man, and would fight with them, so then we'd have to move. Later he had asthma, which kept him from working at all. Sometimes we didn't have enough to eat. My mother tells me that she would make a soup with two eggs and some vegetables, and make it stretch so it would feed the whole family. She'd have to borrow tortillas from the neighbors to eat with it. Or if there wasn't enough corn for the tortillas, she would combine corn with sorghum to make them. That would satisfy our hunger, and maybe we'd have some left over for the following day. In many little towns, especially up in the mountains, people still live this way. They don't have enough money even to buy beans — just enough for tortillas to eat with salt. We had no money to buy beef or pork. Ironically, today I consider it a sin to eat meat, but at that time I was ignorant. When my mom would say that someone had given us a present of meat, we'd be really happy. There were six of us kids and we all had to help so we would have enough to eat. I would often go and cut wood, and then bring it to a tortilleria or a bakery in the nearest town. I'd bring home 15 or 20 pesos. My sisters would go door to door among the neighbors, offering to wash their clothes or grind their corn to make masa. My older brothers looked for work in the fields. At the end of the week they'd come home with whatever they'd earned, and maybe a little fruit or vegetables as well. I just went to primary school, and even that was a sacrifice. As we got older, little by little we all left for the city to go out on our own. We wanted a new way to live. I was thirteen when I left to go to town to learn a trade. By then my father and mother had separated. In the nearest town I'd chop wood, wash cars — whatever honorable work I could find. I went to Salina Cruz, a nearby port city, where I loaded and unloaded ships. There were lots of young people like me — living on the streets, looking for work by the day or week. It was like being a day laborer here. I began to eat better and would even go to restaurants. In those days I didn't lead a very spiritual life. I didn't have much discipline. I met women with a lot of experience, who'd had adventures before I came along. But these relationships didn't last. I was young and poor, and that's not what they were looking for. Finally I got together with a woman for ten years, and we had three children. A lot of companies from the US and Korea were building factories where I lived, especially for clothing. They had a lot of jobs for women on the sewing machines. I understood hydraulics and industrial mechanics, so I got work, too, but the pay was very low. When I was still living with the children's mother, and working in the factory, we ate pretty well. We had meat twice a week, beef once a month, and salads, as well as beans, rice, pasta, and vegetables. She made corn tortillas at home. I told her, I don't care what I eat myself, but I want the children to eat well, so they'll grow the way they're supposed to. I was 32 when I came to the US the first time, in 1998. The violence and crime in Mexico was getting worse, and work was getting harder to find. My brothers said getting there might be hard, but it would be worth it because I'd earn more. A better future, right? I came here to earn money to help my family at home. My kids are getting older now, but they still need my help. That's the main reason I'm here. I don't want them to live the same kind of life I had when I was a boy. At first I was sending money home quite often because I found a lot of work. But their mother didn't use the money well, and the kids weren't getting a good education. We had a lot of disagreements about it, and finally ended our relationship. I've gone back to Mexico every two or three years to see the children since then, to see if they're being brought up well. The oldest one is seventeen now, the next is fifteen, and the youngest is thirteen. I stay with my mother or brothers, since I don't have a house of my own. Then the kids come over to my sister's house, which is where we see each other.